Timber Cove guests enjoy a wide range of activities. One of the advantages of being secluded in one of the world’s most beautiful settings is that the activities to choose from are that much more rewarding. Timber Cove curates daily activities for guests, including guided hikes and wine tastings. Extensive activities are also available in the surrounding areas. Whether paddling in the open ocean or playing ping pong in our Outdoor Living Room, you will always find something to sooth your heart and mind at Timber Cove. California is known for its variety of quality wineries and vineyards. 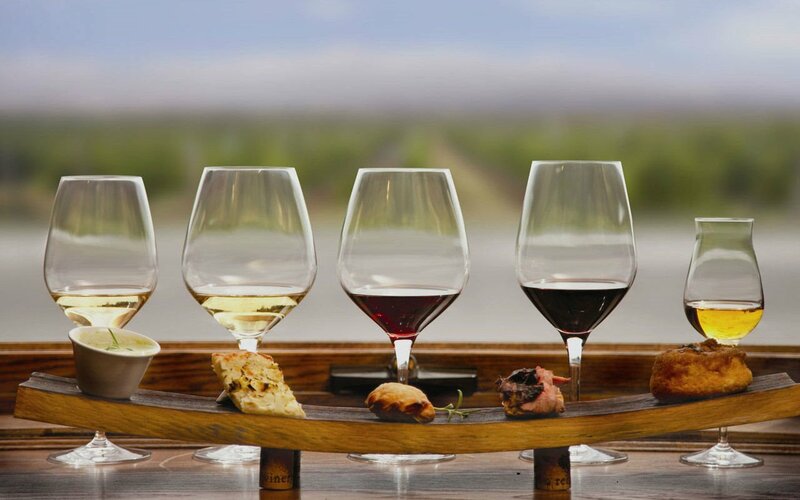 The Northern California wine region and the natural landscapes that surround it provide excellent and intimate wine tastings. Visit our Food & Wine tab for further information on the wines available at Coast Kitchen, our on-site restaurant, or book a private meal with wine pairings in Coast Commune, our exclusive dining room. Take advantage of the beautiful scenery surrounding Timber Cove with a hike along Sonoma's stunning coast. With over 2 miles of hiking trails across our property, head down the steps towards the Cove, venturing our to the furthest corner where the stream can be found – or head back along the cliff’s edge to the further point. Benches can be found across the property to stop and watch the whales. 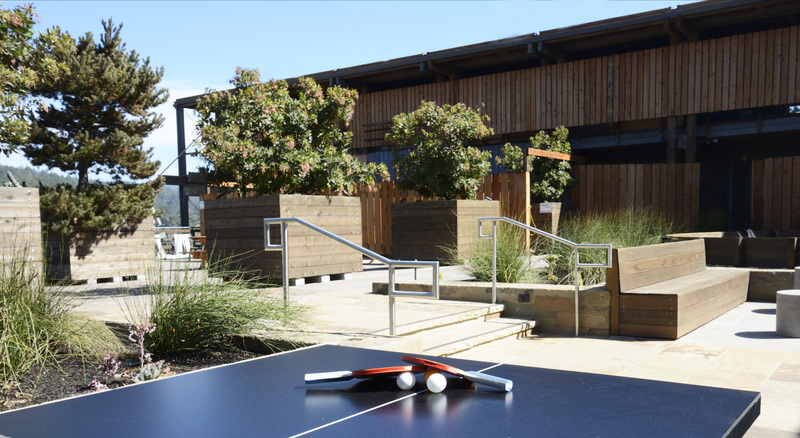 Feel free to enjoy ping pong, foosball or pool in our outdoor living area. Speak to the front desk for paddles, balls, and billiard cues. Or warm up with a glass of wine or a latte on our custom made bench swings, or by the glow of our new outdoor fire pit. Notice the Benjiamino Bufano white marble female torso, which was gifted to our property by the artist because he thought it was the perfect setting for his sculpture. Please be respectful of the guests whose rooms are above the outdoor living room. The fire pit and game tables close at 9 pm daily. The fitness center is open daily between 9 AM and 8PM. Towels and water are provided on a complimentary basis. Please inquire with the Front Desk to schedule private workout or yoga sessions. California's Sonoma Coast is known for its incredible views, including the views after the sun sets. Grab a blanket for star gazing to take advantage of the beautiful night time show. Our suites come equipped with binoculars for stargazing (and whale watching!) – and we also have a telescope on-site. Ask our front desk for details on borrowing the telescope on nights with particularly clear skies. Gaze at the ocean and watch the sunset from our ocean side fire pit. 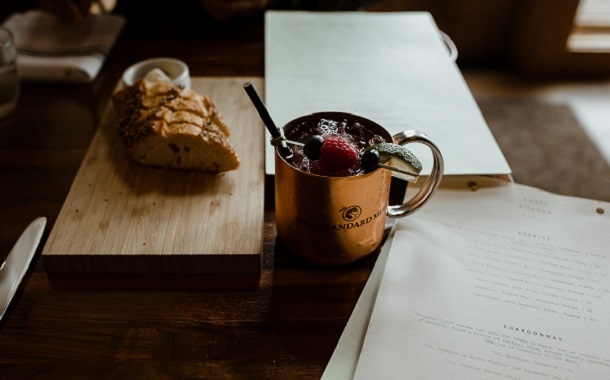 It is the perfect spot to sip fireside drinks from our Coast Kitchen menu. Our predominant piece is the Madonna of Peace obelisk standing 93 ft. tall on the cliffs overlooking the ocean. In 1982, the state acquired the 60-foot-diameter plot of land around the sculpture making it the second smallest California State Park and named it the Bufano Peace Statue Monument. An assortment of intriguing merchandise, including luxurious LATHER spa products and whimsical gifts, is available at the gift corner in our Great Room. Relax and bask in the California sunshine at our local beach, Timber Cove Boat landing, right next to the resort. In partnership with UNBEATEN PATH TOURS & YOGA, Timber Cove offers weekly Yoga class. 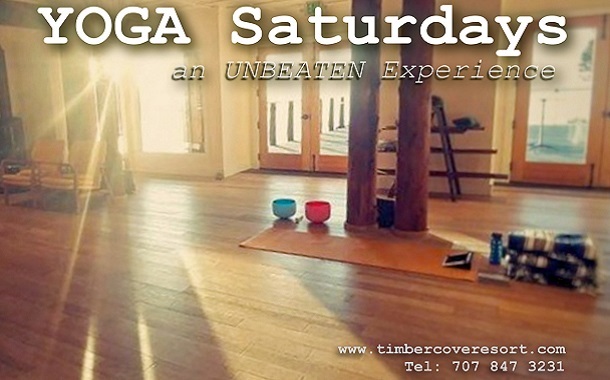 Yoga at Timber Cove Resort Every Saturday from November 3, 2018 to January 26, 2019. 9 am to 10am. Complimentary for resort guests. Yoga mats are provided to resort guests. Open to community for $10 per person. For more information, please contact the Front Desk. – No advance reservation required. Located 15 minutes South of Timber Cove Resort. – No advance reservation required. Located 45 minutes Northeast of the hotel. – No advance reservation required. Located approximately 50 minutes from Timber Cove. 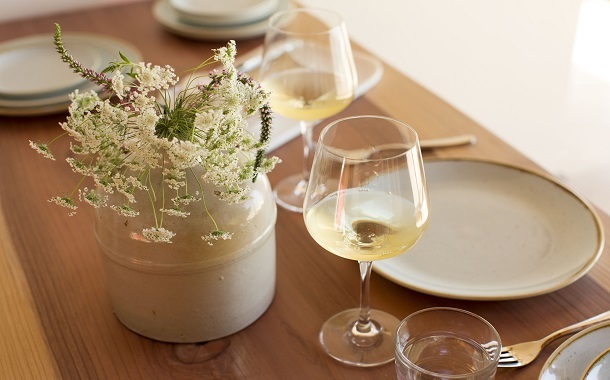 – Tasting room reservations in Healdsburg by appointment only, not open to public. - Vineyard tours weekdays with availability, by appointment, at least two weeks in advance through the concierge. Located 15 minutes South of Timber Cove. Looking to wine taste while staying with us? 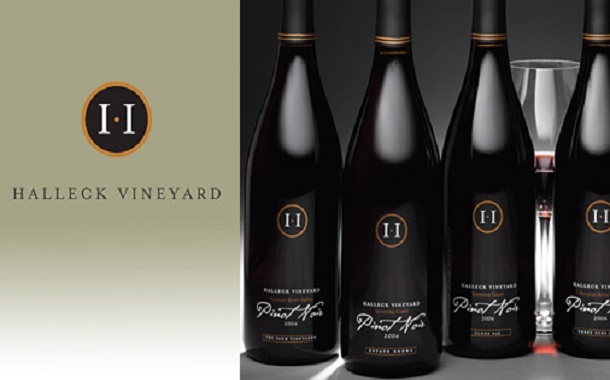 Ask our front desk about our Winery Passport Program! Timber Cove has partnered with several Sonoma County wineries to offer our guests an exclusive opportunity to participate in VIP tastings as well as receive discounts off of reserve wines at wineries such as Sonoma Coast Vineyards, Sonoma Cutrer, DeLoach, Dutton Goldfield, Seghesio, Alexander Valley Vineyards, Hook & Ladder, Martin Ray, Iron Horse, Emeritus. Reservations are required in advance through the concierge. *Tasting rooms are between 45 and 80 minutes from Timber Cove Resort. Please drive responsibly! No reservation is required for tastings but for special or group tastings, please call ahead. Check online for seasonal hours of operation. The Tasting Room is closed on Thanksgiving, Christmas, New Year's Day and Easter. You may also make a reservation with CellarPass. Located 15 minutes South of Timber Cove Resort. Vineyard tours weekdays with availability, by appointment, at least two weeks in advance through the concierge. Rocky promontories, kelp-dotted coves, open grasslands, forested hills, pristine prairies and pygmy forests. You can experience all of these coastal wonders within the Salt Point State Park. 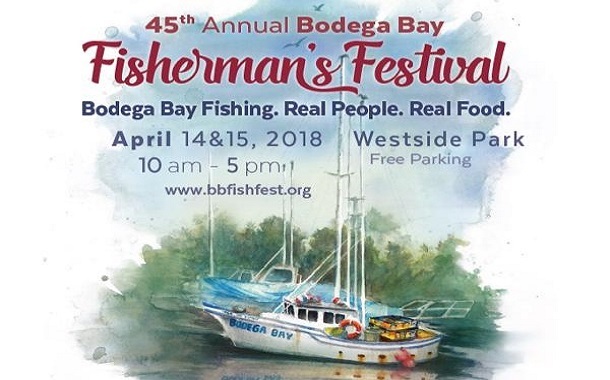 With 20 miles of hiking trails, over six miles of rugged coastline, and an underwater park, you can enjoy a variety of picnicking, hiking, horseback riding, fishing, skin and SCUBA diving and camping. Day use fees are $8/vehicle. Salt Point State Park is located on Highway One, approximately four miles north of the resort. The serene, majestic beauty of the Grove is a living reminder of the redwood forest that covered much of this area before logging began in the 19th century. Armstrong Redwoods preserves stately and magnificent Sequoia sempervirens—the coast redwood. Day use fee is $8/vehicle, $7/vehicle for seniors, and free to pedestrians and bicyclists. The Sonoma Coast State Park boasts a number of picturesque state beaches along the California Coast, perfect for a camping or hiking excursion. The Russian River flows through Sonoma and Mendocino counties with plenty to do and see. Highlights include swimming, paddle boarding, wine tasting and delicious dining. Goat Rock Beach is located between Goat Rock Point and the Russian River along the Sonoma County coast close to the town of Jenner. It is a great beachcombing beach and offers beautiful views. The Black Point Beach staircases lead to secluded beaches with sandy coves, tide pools, and natural rock formations. In addition to hiking, these public access points offer diving, fishing, boating, and wildlife observation. In the beautiful coastal foothills of Northern California sits Lake Sonoma. The lake is surrounded by Sonoma County vineyards and land rich in history, providing a number of recreational activities. Grab your fishing pole and tackle box to enjoy the great outdoors with a fishing day trip. 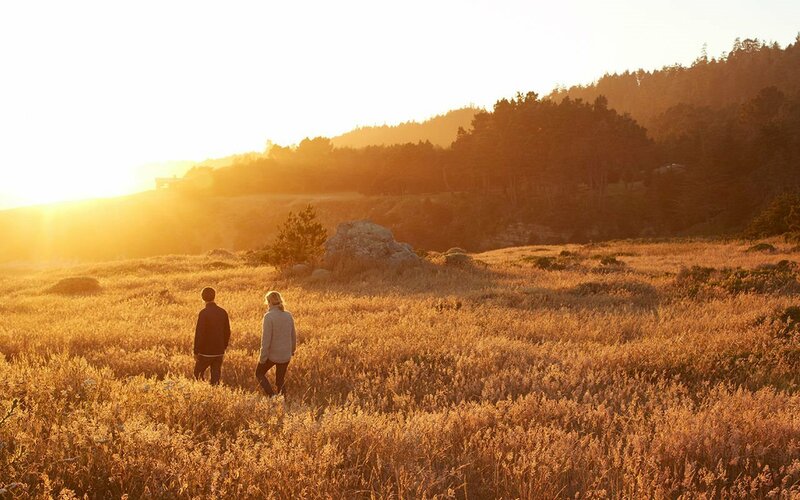 Located high above where the Russian River meets the ocean, the coastal village of Jenner offers spectacular vistas, stunning sunsets, and an opportunity to connect with nature along the beautiful Sonoma County coast. 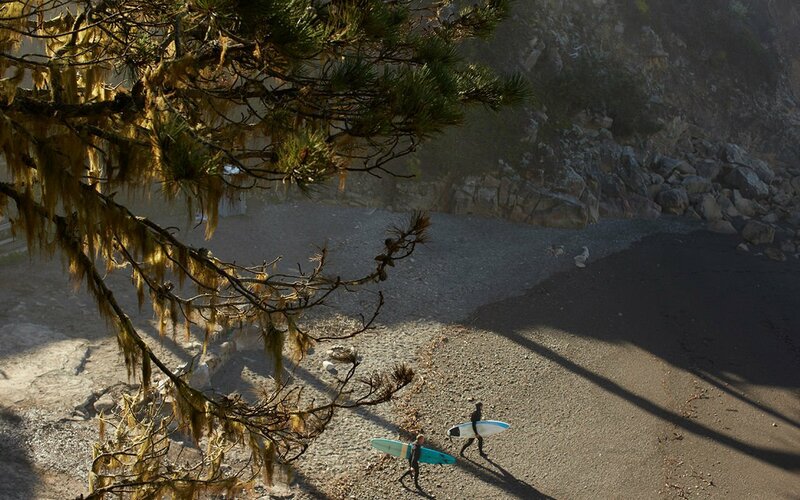 Enjoy the breathtaking beaches and rugged coastline of Sea Ranch, located on Pacific Coast Highway. 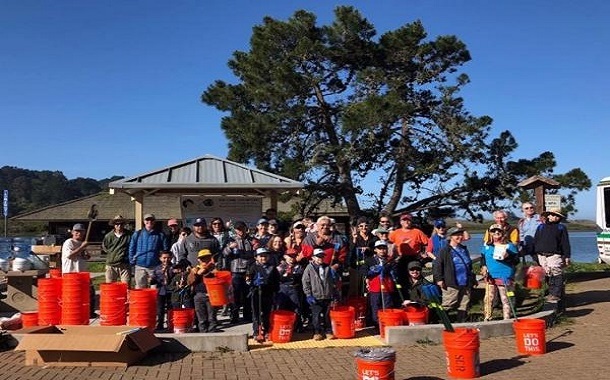 Immerse yourself in a variety of local activities and of nature in the great outdoors of Sea Ranch. 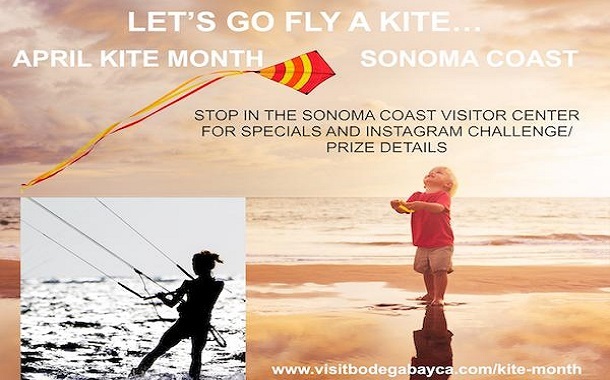 Bodega Bay is a picturesque fishing village on the Sonoma Coast known for its beautiful cliffs and beaches, the perfect place for a hike, whale watching, or surf lessons. Bodega Bay is also where the famed Hitchcock movie "The Birds" was filmed. Tomales Bay is best known for its dramatic landscape views and oyster shucking. Additionally, Tomales Bay is the ideal spot for a variety of outdoor activities, including kayaking, horseback riding, and hiking. Stewarts Point is perched on a bluff overlooking the rugged and beautiful Sonoma Coast and ocean. This charming town boasts a rich history just waiting to be explored. Monte Rio is located along the Russian River and is the perfect place for a day filled with biking, fishing and hiking. Santa Rosa is nestled in the urban heart of California's wine country. It is the hub for all there is to do, see, eat, drink, bike, hike and explore in the area. Sebastopol is a small dynamic community in Western Sonoma County with a rich agricultural history, embracing fine arts, dining, wine and farming. Healdsburg is located in the heart of Sonoma Wine Country and combines small-town charm, stunning views, a close proximity to prime winegrowing regions and a rich history.